Your family dentist in Vancouver, Dr. Dale Nelson, wants every patient to enjoy the very best oral health possible. 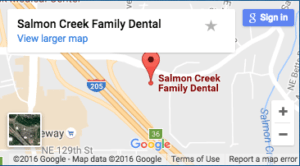 It’s our goal at Salmon Creek Family Dental to provide patients with the information they need to enjoy a lifetime of healthy teeth and gums. For most patients, enjoying quality oral health requires they brush and floss on a daily basis. Unfortunately, according to studies conducted by the American Dental Association, 40 percent of Americans don’t brush regularly or long enough to adequately prevent the effects of tooth decay and gum disease. Whether people just don’t have the time or they don’t enjoy the brushing process, there are a number of reasons patients give for not practicing the right kind of daily oral hygiene. But now a new study from Japan has shed some light on an unexpected factor that helps determine how well we clean our teeth and how willing we are to brush– the sound of toothbrush bristles rubbing against our teeth. Researchers hope to use this latest revelation to create a new type of toothbrush that will help improve oral hygiene. As part of their study, researchers conducted clinical trials with volunteers who agreed to use modified toothbrushes that contained small microphones. Researchers used these brushes to listen to the sounds made in the mouth during brushing. They then modified the noises and fed the sounds back to the volunteers through headphones to see what effect the sound change had on participant satisfaction and cleaning proficiency. Researchers discovered that by changing the pitch, or loudness and frequency, of the brushing sound, they could alter the participants’ opinions regarding performance and comfort about brushing. Researchers also noted that by progressively increasing the frequency of the sounds as teeth were being brushed, the study participants perceived brushing as a more comfortable and enjoyable experience overall. Researchers also hoped to prevent participants from overbrushing with too much excess force. So participants could better maintain an even amount of pressure while brushing, researchers added a built-in sensor to the toothbrushes that would emit an auditory response when too much pressure was applied. While the toothbrush used in the trial required users to wear headphones while brushing, researchers understand that’s not practical for day-to-day use. However, they hope to utilize a bone conduction speaker system that could create auditory sounds during brushing that would improve brushing performance while also decreasing the risk of overbrushing. Until the day when these types of advanced toothbrushes hit the market, patients will just have to continue making brushing a regular part of their day. The ADA recommends brushing twice a day for at least two minutes at a time, once in the morning and again at night. If you have any questions about the best brushing practices, feel free to ask Dr. Nelson, your family dentist in Vancouver, during your next appointment at Salmon Creek Family Dental.